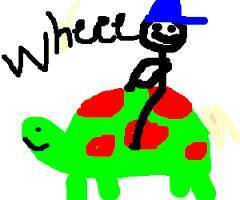 In the morning, I got on my turtle to ride into town. By the time I got to town, it was night and everything was closed. I turned my turtle around to go back home. I said that I like to travel more naturally. I said that I didn’t mind because I liked our time together.